Near Taos mountain, in the village of Taos, experience outstanding quality, attention to detail, and comfortable elegance in this romantic AAA 3 Diamond bed and breakfast inn. Six individually decorated guest rooms boast private baths, king or queen beds, fluffy robes, coffee makers, mini-fridges and local art. Some have cable TV/VCR, others wood-burning fireplaces and seating areas for snuggling. Dial-up or wireless internet access is available 24 hrs/days. Whether you're coming for a Keystone conference, an art class, the wool festival, to ski, raft, hike, or just to rest and relax, this is the place for you! Begin your day with freshly-ground coffee, a scrumptious breakfast, and stimulating conversation. Gather around a crackling fire for afternoon tapas and concierge services from you hosts. After dinner, stargaze in the hammock for two before retiring to your room for a great night's rest. 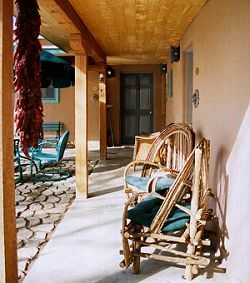 This and other Taos Bed and Breakfast Inns can be found here online in The Register. Romantic Inns, Getaways and B&Bs offer a great lodging alternative to big hotels.